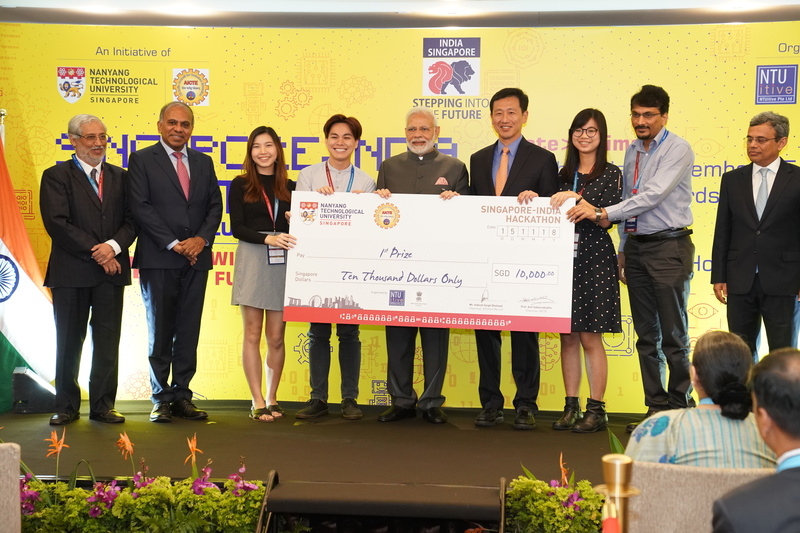 Indian Prime Minister Narendra Modi felicitated the winners of the first India-Singapore Hackathon, a fast-paced 36-hour competition to develop creative and innovative solutions focused on the theme ‘Smart Campus’. 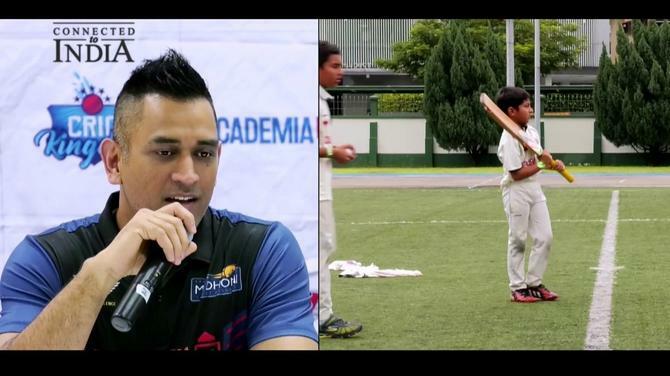 Students of both India and Singapore enthusiastically participated in the fast-paced event. 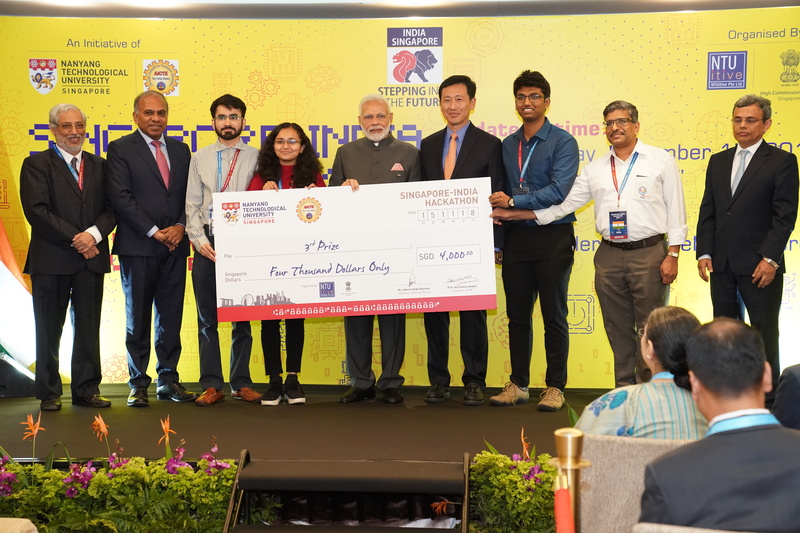 The Nanyang Technological University (NTU) in Singapore and the All India Council for Technical Education (AICTE) of India conducted the hackathon that included solving eight problem statements. 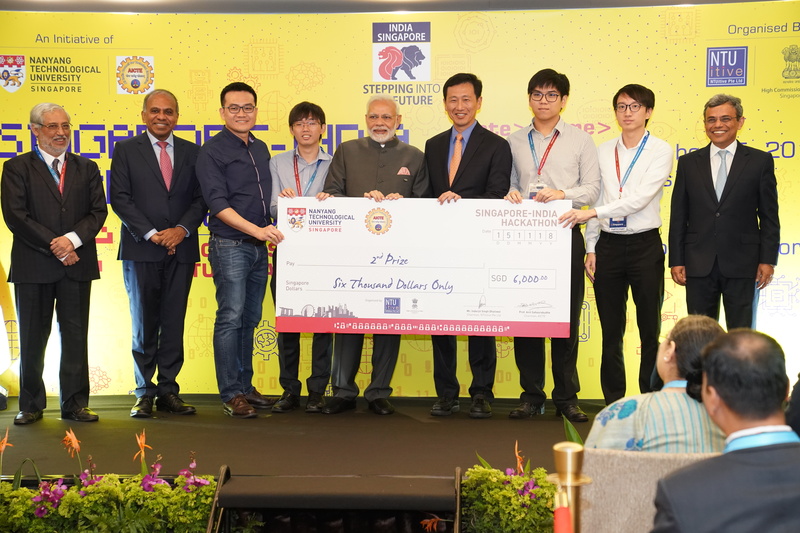 “PM Narendra Modi met and felicitated the winning teams of India Singapore Hackathon, agreed to during the visit of PM to Singapore in June 2018," Ministry of External Affairs spokesman Raveesh Kumar tweeted. 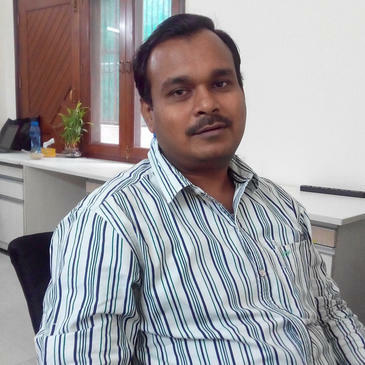 “Happy to have met innovators who won prizes in the first-ever Singapore-India Hackathon. They talked about their extensive work. 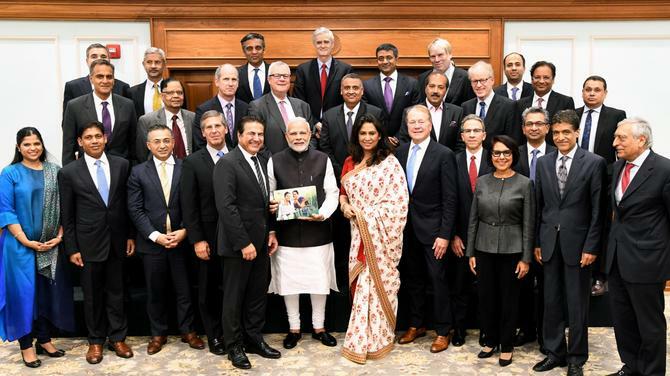 I was impressed by their passion and commitment towards solving problems our world faces,” Modi said. 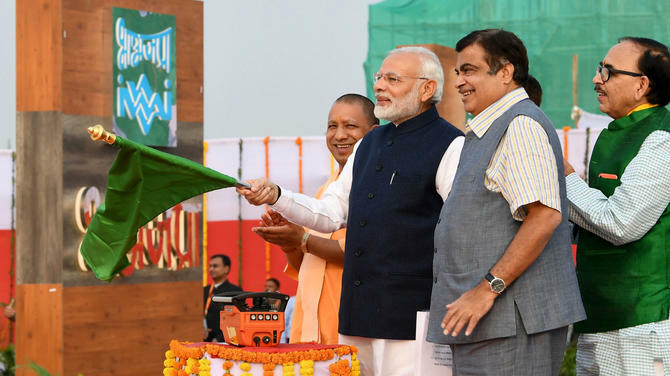 Twenty teams, each from both the countries comprising university and college students selected on a nationwide basis, participated in the event to harness and showcase the innovation potential of the youth. Each of these teams had three students and one mentor. 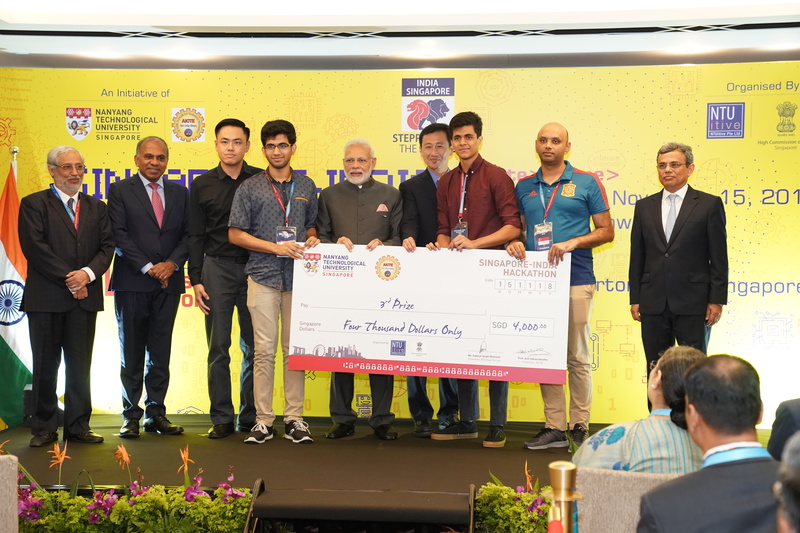 The competition saw two top teams from India and Singapore with the most innovative solution presented with SGD10,000 (USD7,271) respectively, while the second and third prize-winners won SGD6,000 (USD4,363) and SGD4,000 (USD2,908) each. 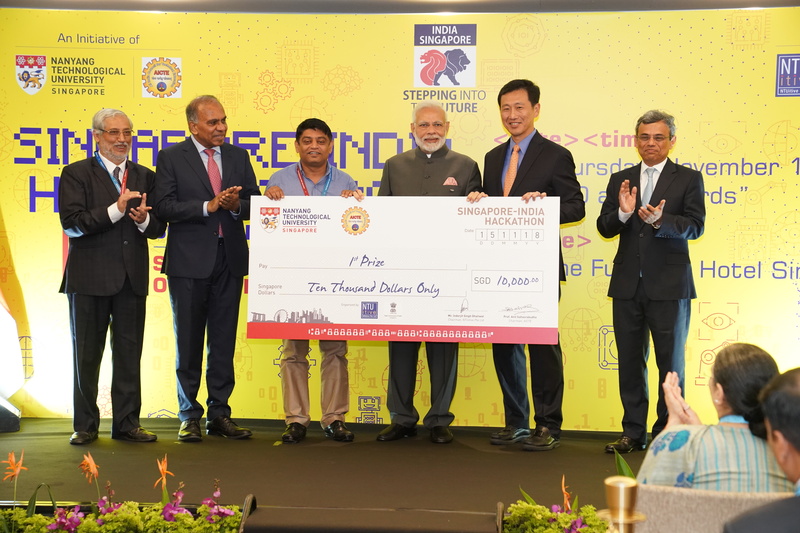 Indian Prime Minister Narendra Modi and Singapore’s Education Minister Ong Ye Kung presented prizes to the winners of the Singapore-India Hackathon at the Fullerton Hotel today. 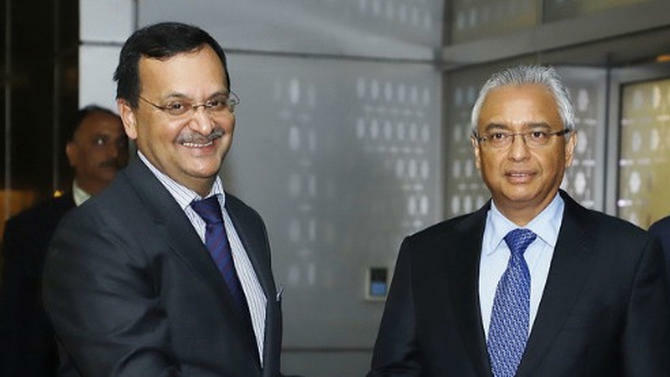 NTU President Subra Suresh and High Commissioner of India to Singapore H.E. Jawed Ashraf were also present on the occasion. 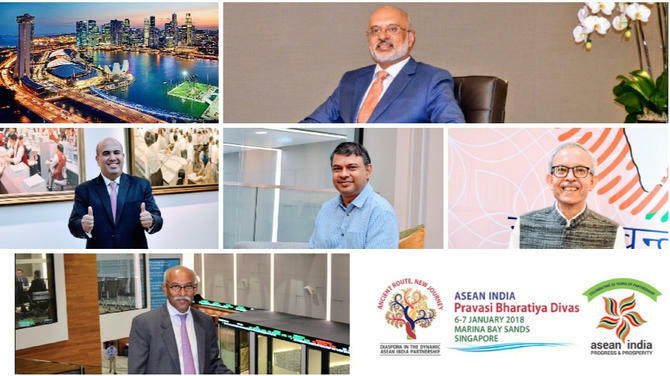 From India, an 83-member delegation comprising 60 students, 20 mentors and three officials of the AICTE visited Singapore. 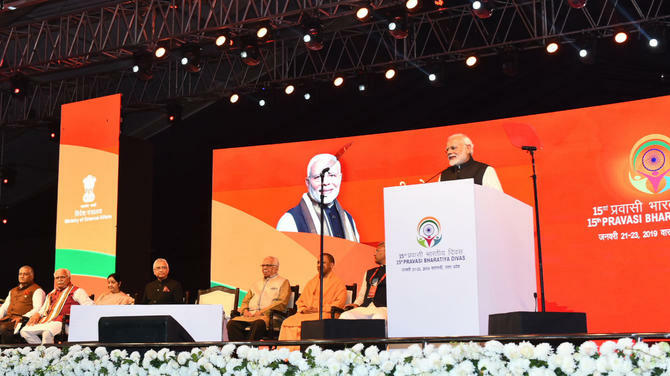 “Platforms like the Singapore-India Hackathon serve as excellent opportunities for our youngsters to showcase their work. They also serve as forums to learn about pioneering innovations by youngsters from other nations and institutes. A win-win for our students!" 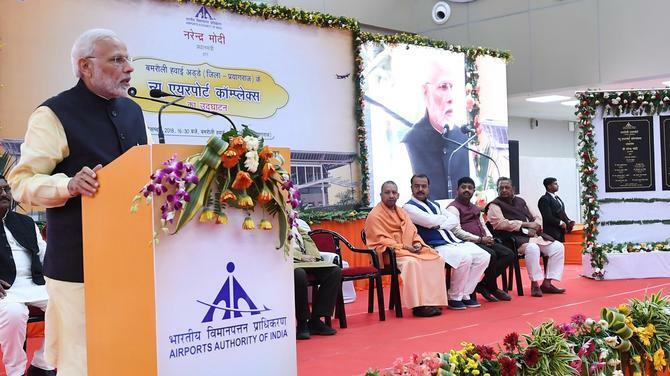 Modi said in a tweet. Platforms like the Singapore-India Hackathon serve as excellent opportunities for our youngsters to showcase their work. They also serve as forums to learn about pioneering innovations by youngsters from other nations and institutes. A win-win for our students! 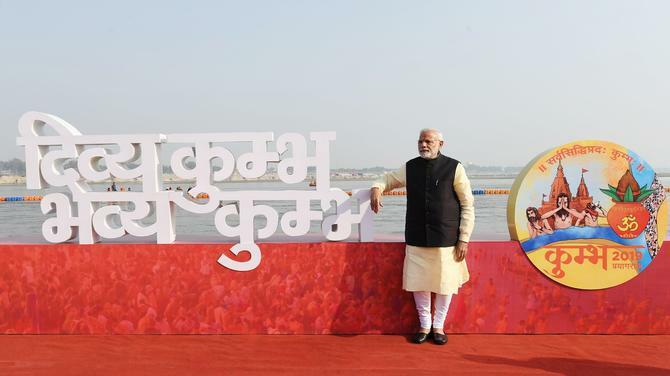 The hackathon is the first of its kind and it was suggested by Indian PM Narendra Modi during his official state visit to Singapore in June 2018. 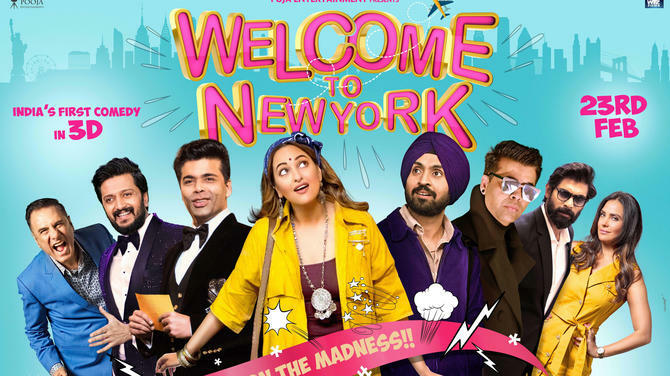 The hackathon had 20 teams of three university students each from India and Singapore, participating in a 36-hour challenge at Nanyang Technological University, Singapore (NTU Singapore) from November 12 to 14. 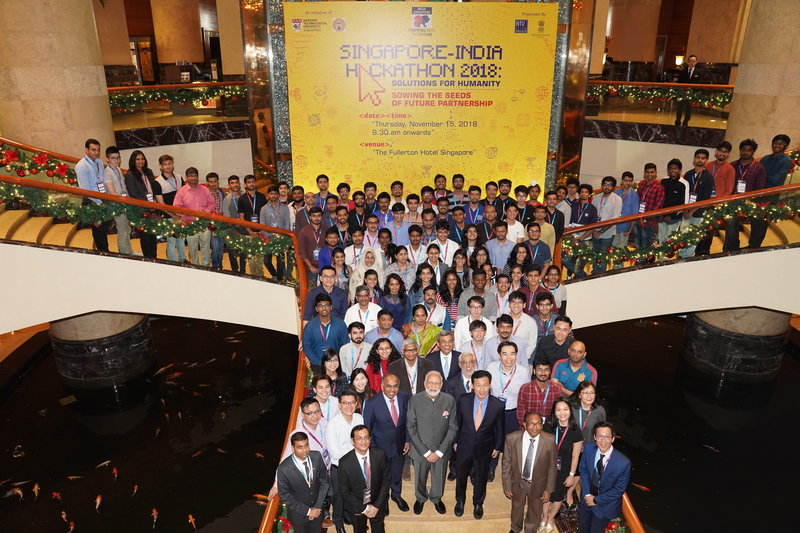 The High Commission of India in Singapore facilitated the Singapore-India Hackathon in collaboration with Ministries of Education and Foreign Affairs of Singapore. The 20 participating teams competed to build innovative tech solutions that address the theme "Smart Campus". 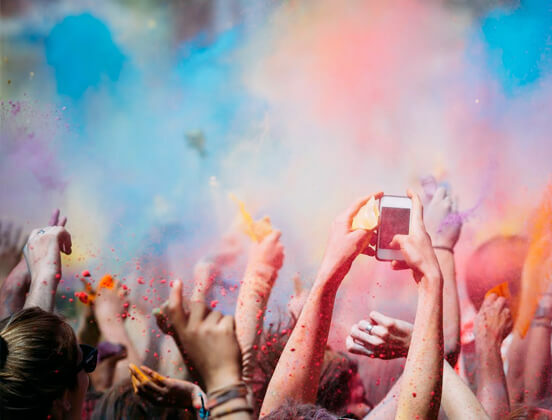 This includes presenting their own original ideas, such as on how to navigate a campus efficiently outdoors and indoors, how to enhance learning using technology, how to manage one's digital identity, and many more. The teams also proposed solutions focused on parking on campus, effective learning, event management, and personal security. 1st Prize: Team Vandhe (NTU), comprising Lim Sheng Rui Varick, Dhea Mariesta, and Mandy Wong Suping, proposed a community-based learning platform that encourages student collaboration and mutual learning, and offers professor-approved answers to solution sets for past year papers. 2nd Prize: Team ZPJ (NTU), comprising Liew Yi An Jordan, Tan Zhi Wei, and Tan Pin Da, came up with an app for users to find their way on campus by offering optimised walking routes and recognising locations based on landmarks. 3rd Prize: Team Rakshacam (SUTD), comprising Nagaraj Lakshmana Prabhu, Rahul Parthasarathy and Rahul Bhattacharjee, presented a video analytics solution to track vehicles in carparks, and potentially provide users information regarding where their vehicles are located. 1st Prize: IIT Kharagpur Team2, comprising Pranjal Shankhdhar, Madhav Datt and Anurag Bharadwaj, came up with an Augmented Reality navigation app for users to find their way indoors, and which can also be integrated with Google Maps. 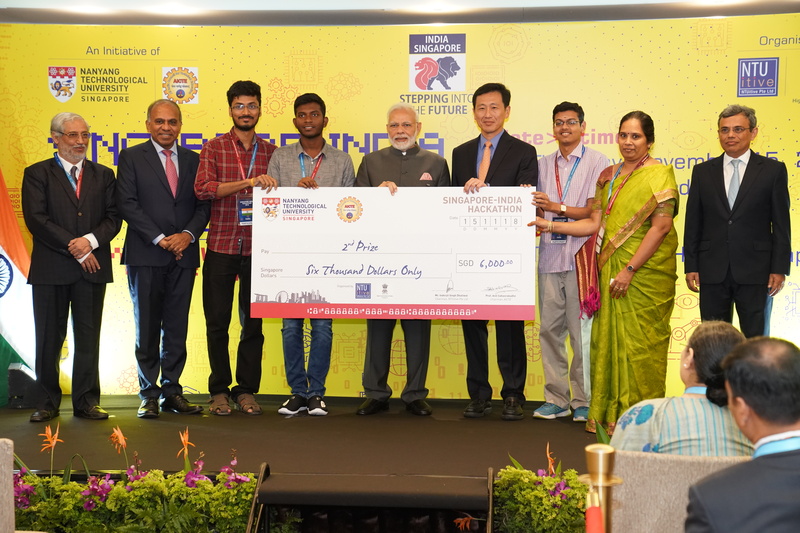 2nd Prize: Team NIT Trichy comprising Kartik Venkataraman, Deep Bhattacharyya and Arutselvan D, presented a smart solution that offers students a holistic learning experience by leveraging on mind mapping, keyword extraction and concept analysis. The system can also link students to external resources and subject experts. 3rd Prize: Team KillerKode comprising Kunal Atul Khadilkar, Akanksha Surendra Kale, and Rahul Yashwant Barhate, proposed a novel parking management system that uses geotagging and "Sound QR" technologies. Later, PM Modi also met the National Cadet Corps (NCC) cadets today who were in Singapore as a part of a cadet exchange programme. “Spent time with NCC cadets, who got the opportunity to come to Singapore as a part of a cadet exchange programme. 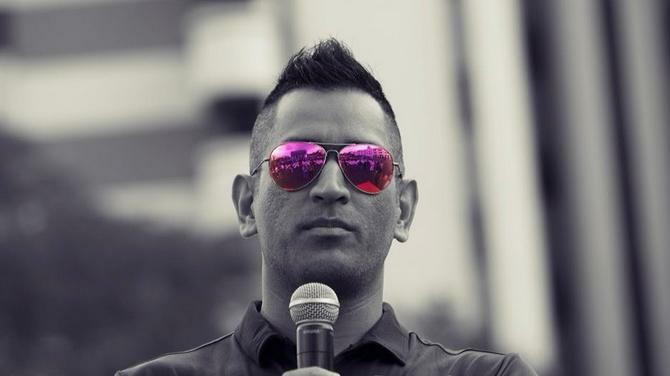 They shared their memorable learnings and experiences with me,” he said. 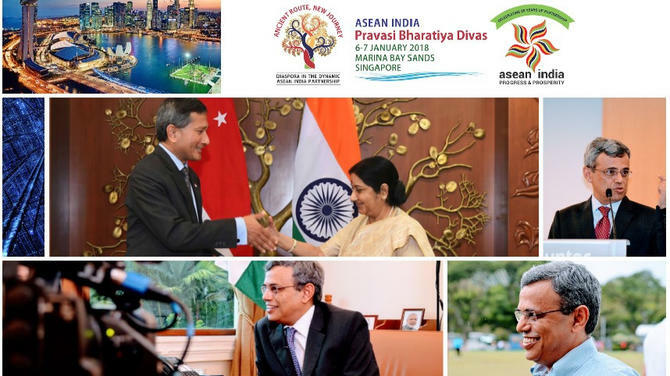 Prime Minister Modi is in Singapore for the two-day visit to the country. He began his visit yesterday by delivering his keynote address at the prestigious Singapore Fintech Festival. He also held separate bilateral meetings with the Prime Minister of Singapore Lee Hsien Loong and Vice-President of USA Mike Pence and discussed ways to further strengthen ties, including in areas of trade, defence and security.